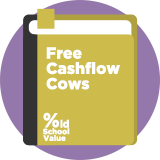 Free Cash Flow Cows is a deep value bargain strategy inspired by the investment writer, Jae Jun at Old School Value. It looks for companies that appear to be cheaply priced compared to the amount of free cash flow they generate. In particular, they should be stable, cash rich companies where free cash flow is actually growing. Among the ratios used in this strategy is Enterprise Value to Free Cash Flow and Free Cash Flow to Long Term Debt. Jae Jun says: "When it comes to true profitability, forget earnings and EBITDA. Free Cashflow is by far the best number to refer to." Jae Jun's backtesting of his own FCF Cows screen found that it beat the S&P 500 in six out of nine years between 2001 and 2009. You can see a back-test for a US variant of this strategy here.